A comfortable ride for 5 passengers with the right height Not too Low not too High. I and many my age group and up have bad backs and or knees...so getting in an Out Must be a Comfortable experience as well! Too High...Too Low...making it difficult for me and Uncomfortable to get in and out. 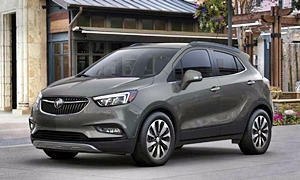 Not too high/low, great gas mileage, quiet and smooth ride, and 18 feet of cargo room you must be talking about the Buick Encore or Chevy Trax? Thanks for providing specific information! Not a lot of people do that. What you won't like is a sedan or low hatchback. A small (or subcompact) SUV seems perfect for you, but there isn't much selection at your price point. Unfortunately there are not many great new cars in your price point. They will be more uncomfortable than an SUV that is 3 grand more. 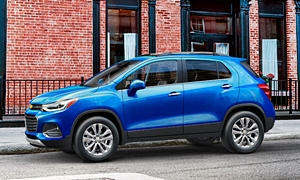 The Chevy Trax isn't a great car. It's a very poor value. For $21k, you don't even get cruise control. You have to go to the $23k LT. Also, it's not very highly rated. 2018 Toyota C-HR ? This is probably my #1 choice by far. It is the best value and is the most luxurious with a quiet cabin and spacious interior. This car has great curb appeal and comes with Toyota Safety Sense standard, their entire suite of safety features which includes Automatic braking with pedestrian detection, full-speed Adaptive cruise control, lane departure alert with steering assist, backup camera, and automatic high beams. They are the best features ever put into a car. Standard features on the base XLE trim include those active safety features, headlights that automatically turn on and off, really cool-looking Vortex-styled wheels, dual zone automatic climate control, auto-dimming rearview mirror, leather trimmed steering wheel and gear shift, auto up/down windows for all passengers, and electric parking brake with the brake hold feature. MPG is 27/31 city/hwy. This car is very new so don't expect many rebates or price markdowns. It rides on the new TNGA platform, which is shared so far with the Prius and 2018 Camry. It's a great platform that makes the car fun to drive. The drawbacks are that it's slow like all the cars in this segment, it has a CVT transmission, and you can't get Apple CarPlay or Android Auto. It has 19 cu. ft of cargo room behind the second row seats. 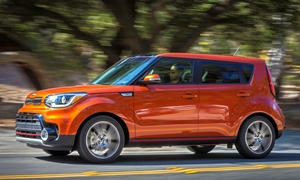 2017 Kia Soul ? The Soul has a lot of curb appeal and is an attractive value. MPG is 25/30 city/hwy. This car will probably have the easiest access of the three cars here. In your budget I would look at the + (plus) trim. It's also the only car I recommend here that doesn't have a CVT. Standard features include headlights that automatically turn on and off, front fog lights, backup camera, 5" color LCD touch screen audio display, cruise control, 1 USB port, 1 AUX port, the FlexSteer system, which allows you to adjust steering feel to Normal, Comfort, or Sport mode, auto up/down driver and passenger windows, and single zone climate control. You can probably get a big discount on the Soul. Also consider a used Soul because Kias depreciate fast. It has been reliable though. It has 24.2 cu. ft of cargo space behind the second rows. 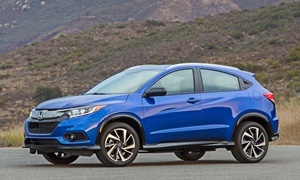 2017 Honda HR-V ? I wouldn't recommend this car as much as the other two, but still take a look at it. It can be had for under $20k. It's very practical with a lot of cargo space and rear seat room. It's very fuel efficient, with MPG at 28/34 city/hwy for the FWD CVT. Backup camera, automatic up/down driver's window, cruise control, two 12 volt power outlets front and rear, and AUX jack are standard on all trims. 1 USB port is standard on the LX and 2 USB ports on the rest of the trims. It is very slow but it is definitely enough power for most people. It has 24.3 cu. ft of cargo space behind the second row seats. Of course you need to test drive all three to see which one fits best. 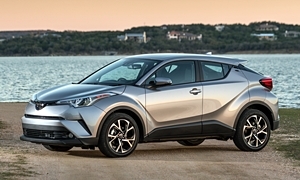 I wouldn't recommend the C-HR to anyone without at least driving one or owning it myself The C-HR does not offer navigation, all wheel drive syatem, or satiilete radio that is offered by all of its competitons. You get one usb port and one 12-volt outlet with no place to put your phone. Along with wind noise, tire noise, and engine noise it is not much more than a golf cart. It's fuel economy is only average as it weighs 200-300 lbs more than it's competitors. Actually ranked last place at No. 42, which is no where near #1. C-HR is ranked last place at #42. The Trax is listed on cars.com for as little as $12,000 or about half the lowest price C-HR is discounted at $22,000. Sure it doesn't include cruise control but the Trax has almost 10 cu ft of cargo space more than the Toyota, offers AWD, and for $289 you can add aftermarket cruise control that works with the steering wheel controls. Toyota shafts the U.S. again by not offering turbocharged engine and AWD it offers in Japan on the C-HR. A U.S. news website cannot be trusted for car information and reviews. Look on a credible car website. The Trax got 2.5 stars and CH-R got 4 stars. Trax is 12 out of 13 subcompact crossovers and CH-R is 6 out of 13. Soul is #1 and HR-V is #11. Encore is #7. The CH-R doesn't have navigation, but it does have a touchscreen with USB and an AUX port. The touchscreen is made to easily be replaced by a high end aftermarket unit with Apple CarPlay. That is however a pro to the Trax, which has CarPlay. The Trax doesn't have as many standard features as the CH-R though and there is a reason the Trax is discounted so much. Brand reputation. 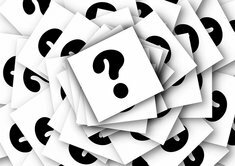 How is Car & Driver rankings determined? Yes, we don't know and can sum it up to advertising dollars influencing the rankings as they provide no metgodology. Furthermore, if you step outside you duel hybrid owning bubble, you'll find that U.S News Rankings is a compilation of American auto journalist reviews. Performance. The performance score represents the reviewer's written assessment of a car's handling, braking, acceleration, ride quality and other qualitative performance measures. Interior. The interior scorerepresents the reviewer's written assessment of the car's interior comfort, features, cargo space, styling and build quality. Critics' Rating. This represents the overall tone and recommendation level reviewers place on a car. In addition to the analysis of professional reviews, we add information of particular interest to new car shoppers, such as safety and reliability data, that isn't part of the critics' qualitative reviews. Safety. The safety score is based on a compilation of scores from leading safety rating sources, including the National Highway Traffic Safety Administration and the Insurance Institute for Highway Safety. Reliability. The reliability score contributing to the U.S. News rankings is the Predicted Reliability rating provided byJ.D. Power and Associates. This score is based on the past three years of historical initial quality and dependability data from J.D. Power's automotive studies, specifically the Vehicle Dependability Study (VDS) and the Initial Quality Study (IQS). Awards. Cars that win major automotive industry awards, such as theMotor Trend Car of the YearandNorth American Car of the Year, receive a bump in their Recommendation score to reflect the importance of these awards. We combine these scores in a formula that is based on what new car shoppers say matters to them most in a new vehicle. The result is an overall score for each new car, which allows us to make head-to-head comparisons of new vehicles, ranking them against each other. The overall score and each component score ranges from 1 to 10, with 10 being the best possible score. The rankings are continually updated based on the latest information coming in from third-party reviews and data sources.As new cars enter the market, they are also added to the rankings and affect how the vehicles stack up against one another.Check back periodically to see how the latestU.S. News Car Rankingsare shaping up." The CHR ranks #42nd of 42 cats for a reason.